When First Direct Arena opened in Leeds this year, they needed the perfect piece equipment to ensure that noise levels were kept within the current health & safety regulations, whilst ensuring the best acoustic and entertainment experience for the audience. It was fitting then that a new venue such as First Direct Arena would invest in the latest digital technology from local noise measurement experts, Pulsar Instruments. 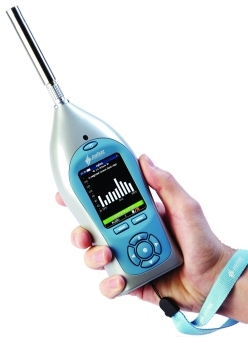 Based in Filey in North Yorkshire, the company recently have launched a new range of powerful sound level meters on the market appropriately named the Pulsar Nova®, meaning ‘new star’. These highly performant decibel meters are perfectly suited for applications such as occupational and environmental noise monitoring in large concert venues where precise noise and impact assessments are required by Law and noise levels must be kept at the right level for all involved. The Arena has played host to a number of big names in the music industry since opening this summer ranging from Bruce Springsteen, Elton John and Rod Stewart and with a full concert programme ahead, the Pulsar Nova® has now become an integral part of any show’s success. The Nova makes the task of taking samples or noise measurements very easy which can be achieved in 3 easy steps: switch the meter on, calibrate and start measuring. Key measurements tend to be taken in different locations and repeated at regular intervals either manually or via the repeat function provided by the instrument and left running for up to 8 hours if needed. The meter can be fitted on a tripod and left unattended as an option. The data is then downloaded and exported instantly onto a PC using the outstanding Pulsar Nova AnalyzerPlus software. All the Pulsar Nova® meters are fitted with the latest OLED (organic light emitting diode) technology for an outstanding visual reading and with illuminated elastomere keypads, thus allowing function keys and data to be seen in all conditions which is ideal for venues where safety staff work without much lighting. Staff at First Direct Arena have benefited from technical support and advice from the team at Pulsar since they received their first Nova meter ensuring that their brand new noise measurement kit was fully maximised. Sarah Brack Managing Director for Pulsar Instruments said: ‘We are delighted that such a fantastic new venue in our region made the Pulsar Nova® their first choice when it came to investing in a noise measurement kit. We have enjoyed helping John and his team become familiar with the product and are proud that our sound level meters are associated with such a prestigious venue and such big names in the music industry’. John Webster, Operations Director at First Direct Arena says: “The ability to comply with Noise at Work Regulations is an essential requirement for a venue such as ours. From the start, we wanted to invest in a trusted brand and a meter that would offer us the right specification and the latest technology to help us achieve compliance. We chose the Nova sound meter from local company Pulsar Instruments plc which meets all our key requirements and we have been delighted with its performance”. Find out more about managing noise at entertainment venues.